Since taking the helm at H. Moser & Cie. earlier this year, Edouard Meylan has embarked on reorganising and revitalising what was a well regarded but loss-making independent watchmaker. Here he talks about the company's turnaround, and his plans for the future. 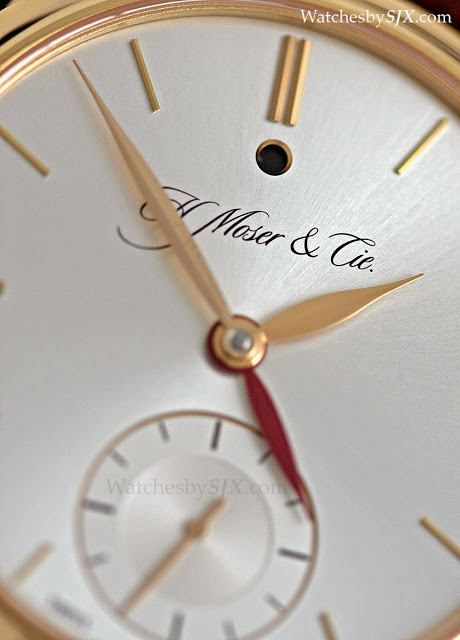 A year ago H. Moser & Cie. was acquired by MELB Holding, a holding company run by Georges-Henri Meylan, formerly the CEO of Audemars Piguet, and Bill Muirhead, who had the top finance job at Breguet before the Swatch Group takeover. MELB Holding also owns Hautlence, another independent brand in financial distress. 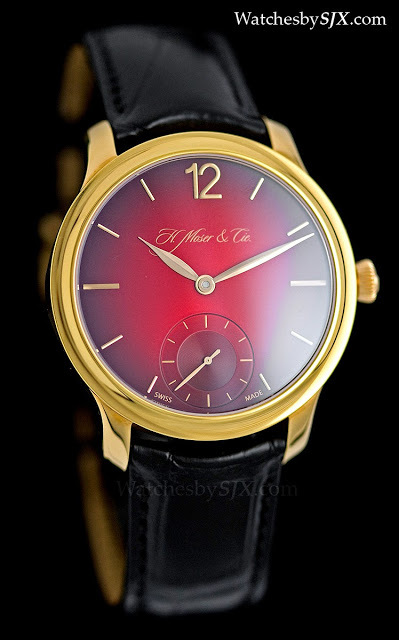 H. Moser is a respected maker of innovative, concise timepieces, most notably the Perpetual 1, but was struggling financially. Founded in 2006 with the backing of Swiss dental implant heir Thomas Straumann, H. Moser was not particularly profitable for Straumann. Bloomberg reported in February this year that H. Moser had cost Straumann over SFr100 million, or about US$110 million. MELB Holding now has majority control of H. Moser, with Straumann retaining a minority stake. In April 2013, Georges-Henri Meylan’s son, Eduouard, was appointed CEO of H. Moser, and tasked with turning it around. Some of the changes are already obvious, including the new “Very Rare” campaign. We spoke with him about the brand’s turnaround, and his plans for the future, including a tantalising hint about a possible in-house chronograph. Here are excerpts from the interview, edited for clarity and length. SJX: Can you explain why your family decided to acquire H. Moser? Edouard Meylan (EM): The brand has a great story and amazing products. And we have access to Precision Engineering [the sister company of H. Moser which makes hairsprings and escapement components]. At Schaffhausen we produce hairsprings and escapements for some of the biggest brands. We can do main plates, wheels, bridges, screws, pretty much everything except sapphire crystals and jewels. SJX: Is H. Moser the first step in a larger plan to build a group of independent or niche brands? MELB also owns Hautlence. EM: Our goal is to be independent and to build a group of independent brands. 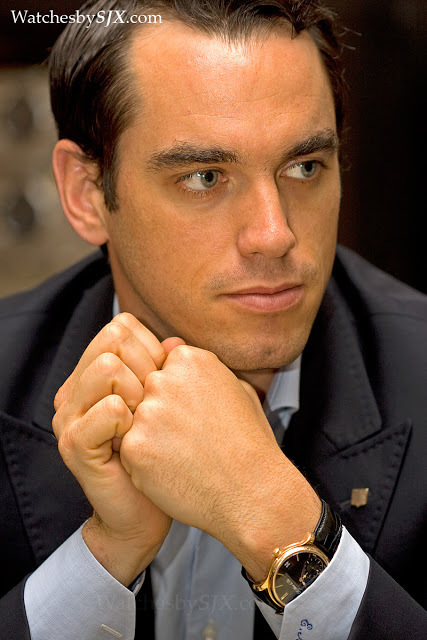 We want to grow the group and that’s why Moser was so interesting for us. SJX: So tell us what’s new with Moser since the takeover. EM: New energy, new faces, new people, new ideas, but the same collection [of watches]. We are not changing the line-up, but streamlining it, and being better in terms of quality and finishing. SJX: Tell us a little about the H. Moser’s situation when you took over. EM: It made losses every year, significant losses, though less than what people usually say. Mr Straumann decided it could not continue like this, so it was either turn it off or sell it. This year we halved those losses, and next year we will halve them again, and then we break even if everything goes well. H. Moser has amazing products but were being sold at a price that was not competitive. The products, because of the volume and complexity, and the production processes, were costing way too much money. Most of the parts were very expensive compared to the competition. Our movements were expensive, because they used expensive parts and took very long to assemble – the perpetual calendar movement took 50 hours. SJX: So what has been done to fix that? EM: We started by focusing on production and quality. Take for example the Perpetual 1. We changed about 40 parts in the construction of the perpetual calendar. In the past each part of the mechanism would have to be manually adapted during assembly, now they fit perfectly. We also had to strengthen the date discs of the perpetual calendar [which are made of brass], because they tended to touch each other [and get stuck]. So we devised a metal coating which strengthens the discs by four times. We used to produce 10 pieces a month, now we can do more than 20. Why? Because we reduced the assembly time from 50 hours to 25 hours. SJX: Now that the nuts and bolts have been sorted out, what is occupying your time? EM: A lot about brand vision. For me, the brand is known by a small group of individuals, people who love watches. What we’re lacking is a strong vision for the brand. That is something we need to communicate. We need a new image for this brand. Now we can invest in marketing because if there is more demand then we have more capacity and the quality. SJX: You mentioned pricing earlier. 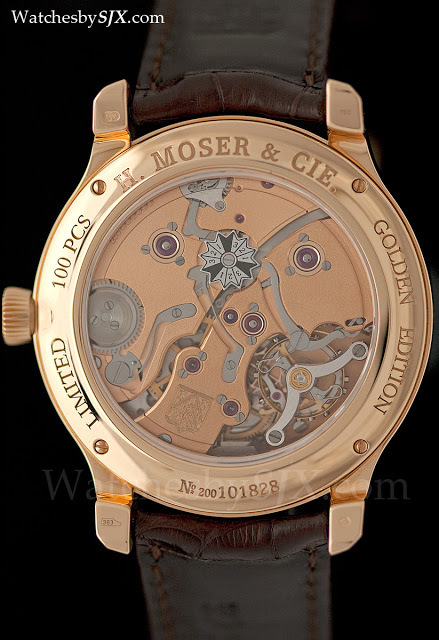 Do you have plans to raise the prices of H. Moser watches? One of their selling points has always been the reasonable value proposition. EM: No, we raised prices last year, and are not planning to further out. The challenge is to go further down in cost without compromising quality. In fact, by increasing production efficiency, we increase quality at the same time because reliability increases. 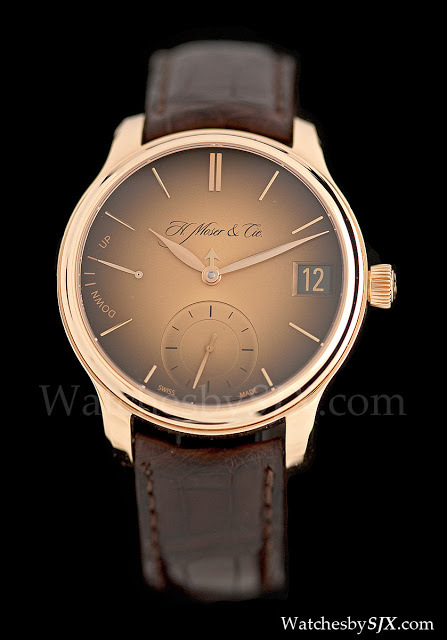 SJX: On the subject of reliability, certain H. Moser watches had reliability problems early on. Have those been solved? EM: Yes. That’s why in the beginning we focused on production and quality, to make sure that what we sell is not going to come back. I want to make sure that everything which leaves the factory is top quality. SJX: What’s H. Moser’s production like now? EM: A bit more than a thousand. We need to double to make it sustainable, and we have plans to go beyond that. SJX: But the plan is to stick to the current philosophy of quality, in-house movements regardless of production figures? EM: We want to stick to manufacture movements. As you know with manufacture movements, with the kind of volumes we do, we cannot go further down in price. There’s economy of scales kicking in at about a thousand movements, but for the same movement. At the moment we do a thousand watches, but with six different movements. We can leverage on our movements because they are now mature. In the longer term, we want to have more competitive prices for our movements, and to offer different versions of our movements to wider markets. For example, the Moser version of the movement has a modular escapement running at 2.5 Hz. We could have something using the same main plate but with an integrated escapement and 4 Hz for other brands. 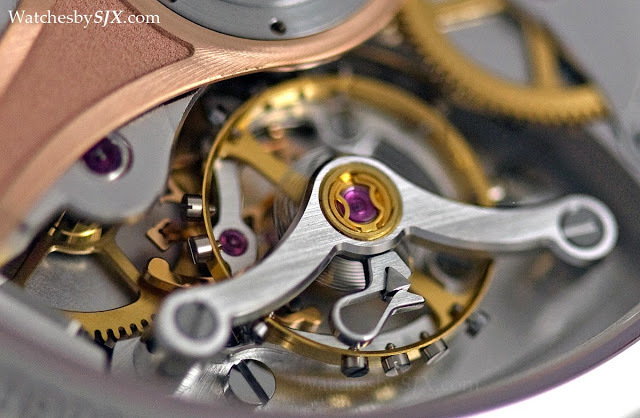 SJX: The Perpetual 1 movement was developed jointly with Andreas Strehler. Is development done in-house now? EM: Now we develop internally, we have our own constructor. We have strong expertise in-house. The person who developed [the perpetual] with Strehler and assembled the first protoypes, he’s our master watchmaker. He was the one leading the re-engineering team. We also play around with friends of ours. For example, we’re pretty close to David Candaux [formerly a constructor at Jaeger-LeCoultre], he is a friend, in fact he went to school with my sister. He’s someone we’re exploring things with. SJX: Can you give us a peek at what Moser has in store for the future? EM: We could play with materials, functional materials. I don’t want to work with steel but we could use titanium or carbon fibre, because it brings lightness and resistance. Steel is just to reduce the price, and as you know, our movements are expensive. I prefer to put it a bit higher, but with materials that bring more value. What Richard Mille is doing, for example, is inspirational. SJX: You used to have some palladium cased watches. Whatever happened to those? EM: We are stopping with that material. Because palladium was not perceived by clients as a noble material, but it was high cost. SJX: Can we expect some radical new products from Moser in time to come? EM: Talking pieces? Definitely. I believe that’s a way to make statements about where you want to go. But I don’t want to be seen as a niche brand. We’re not going to make a crazy watch, we need to make something that adds value to the brand, something that explains what we want to do in terms of functions. SJX: Any hints on what that is? EM: We’re working on two things. One is a talking piece, it’s not a revolution, and a new product line with new case design. For the future, one thing I want is a chronograph. But it has to be a Moser chronograph. It has to something special, something different. It would be elegant, yet bring innovations, with smart functions. The watch must have subtle details, with ingenious functions like our perpetual calendar.